Pikk morphs into Riga Mnt, which itself becomes the familiar E67 again as you leave town. Something approximating a cycle lane runs an uneven, dusty few kilometres from the centre, until you find yourself entering fragrant evergreen country once more. Although the road to the Latvian border is now highway for its entirety, this section of the Via Baltica is surrounded by pockets of great natural beauty, and chock full of surprises. Keep an eagle-eye out for sparrowhawks, falcons and other raptors, beadily scanning the undergrowth for oblivious rodents, from roadside trees. Luitemaa Nature Reserve is the first and most readily accessible of the great wetland parks in Estonia’s southwest. Beginning just outside Võiste and running to Häädemeeste, 25km south of Pärnu, the reserve is a fabulous detour into shimmering peat bog and cool pine copse. The easiest point of entry from the highway is at Tolkuse Bog, said to have derived its name from an irascible hermit who absconded from the army and settled here. Leave your bike by the side of the road and descend. A wooden walkway circumvents the area for a kilometre, culminating in a broad lagoon with several raised islets. 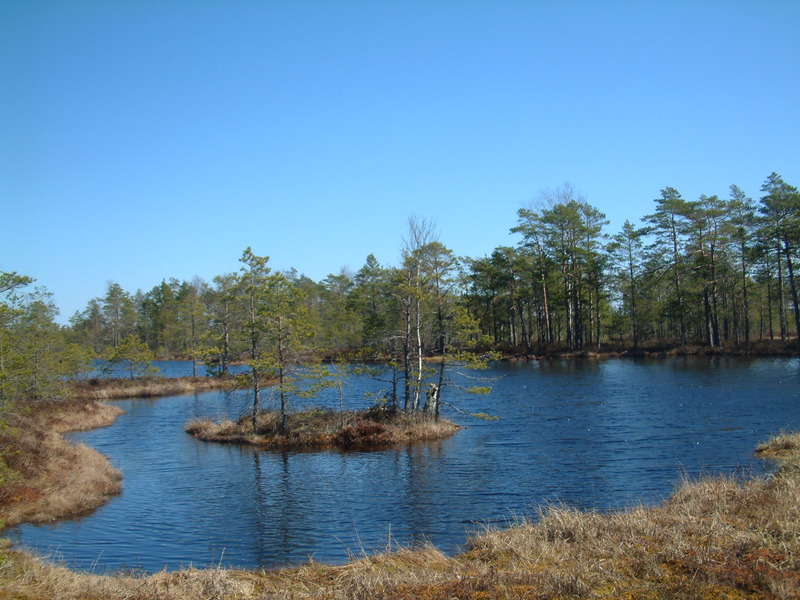 Formed more than 6000 years ago between the shores of two prehistoric bodies of water – the gargantuan Ancylus Lake, which stretched to Arctic Sweden, and the Littorina Sea, sweeping in from the Straits of Denmark – the bog is one of the few in Europe to have developed from a lagoon mire. Peat is remarkable stuff. Trapping pollen before it has the chance to fully degrade, it allows scientists to document the chronology of flora development over millennia with an astonishing degree of accuracy. It’s an integral component in the earth’s carbon cycle that has been shamelessly abused. Under Soviet occupation, the bogs were drained for their peat – a low-grade fossil fuel. Fly-ash pollution from nearby power plants compounded this assault. But by 1981, a rigid set of guidelines was implemented ensuring the protection of designated mires. Tiptoe along the creaking planks and you’ll chance upon the bog’s more curious residents. Nervy grey lizards bask in the hazy beams that puncture the canopy, their spade-shaped heads twitching like maladjusted automatons. Contorting its bullwhip form through gaps in the ragged foliage that buffers waterside and forest, a slowworm crawls – iridescent, languid. In the bubbling copper hollows leading to the lagoon, wild cranberry gleam like miniature reds on toy pool-table. A crescendo of twitters and chirps scores this ethereal scene, a hidden orchestra of woodlarks, reed warblers and nightjars the performers. For the opportune rambler, the call of a distant bull-moose provides a dissonant, staccato bass. At the northern end of the reserve, you’re confronted by some equally impressive and ancient geological features: the dunes that once marked the shoreline of the Ancylus and the Littorina. At 35 metres, the bigger of the two – Tornimäe – is the highest wind-formed mound in Estonia. A path leads up to the top, capped by a 15-metre watchtower and an unparalleled panorama of the Pärnu basin. Acres of low-lying marsh rustle, tickled by a south-easterly breeze that ripples the surface of the lagoon to the south. Reaching out toward Saarema, the turquoise Baltic sparkles proudly in the morning sun. Another hour or so of pedalling and you’re at the Latvian border. It’s a photo-op rush that the rather grimy border control post and its disinterested guards fail to completely dissipate. The name of the border town – Ainaži, possibly a Liv word for “lonely” – is about right. Citybike might tout Salacgr?va as the place to stop today. Don’t bother, at least not for the night. It’s a scattered, and not unappealing, town of three and a half thousand that gets its name from the Salaca, the prime Salmon-spawning waters of Limbazi District for which it also serves as the sole operational port. It might be worth hanging around to change some krooni into latis and grab a bite to eat at the family-run Zvejnieku S?ta tavern, which serves up tasty lamb chops. Nearby are the fascinating red cliffs of Veczemju, Latvia’s longest stretch of sandstone, and the caves of Svetupe where ancient Livs sacrificed to appease their pagan gods. But as the wonderfully helpful Baiba at the tourist office will tell you, Salacgr?va offers only a couple of uninspiring choices of lodgings. Rakari is jaw-droppingly lovely and at 15 LVL a room, outrageously good value. Half an hour south of Salacgr?va, 200 metres past the giant’s chair, you’ll come to the turning on the right. Follow the sandy path for a kilometre to this gem of guesthouse, a pebble’s skim from the edge of the Baltic. Wiry Modigliani-esque sculptures of a surfer with the hotel’s name on his board and a unicyclist doffing his top hat mark the entrance. The hotel exterior, while not quite succeeding in its bid to recreate the feel of a traditional country manor house, is not without charm. The main building consists of seven attractive twins and one larger room for up to 10 guests. There’s a spacious two-floor restaurant and bar area, and a sauna with cold dip for an extra 15 LVL, perfect for those aching limbs. Out back is the camping area with 16 self-contained cottages, each accommodating 3-4 people and complete with TV, internet, and a fully-equipped kitchen – all for 35 LVL a night. Alternatively, you can pitch a tent for a couple of latis. If watersports are your thing, jetskis, windsurfing equipment, and even speedboats are available for hire. In summer, the hotel starts to fill up, though you’ll still probably have no difficulty getting a room, especially with Baiba calling ahead for you. At all other times, you may find only a handful of guests. An early morning wander west through the wooded picnic and recreation area takes you to a picturesque stream flowing straight into the Baltic. Either side of a rickety weir, local fishermen wait patiently for a nibble from the lamprey and vimba that flourish here. On the north bank, grass snakes are a common sight in the dense scrub. Where the river meets the sea, two boulder promontories extend for some distance like the outstretched arms of some prostrate granite leviathan. There are some strange legends about this stretch of coast. Rakar, it has been claimed, was an independent community of Livs with trade links to West Africa. The unlikely route was Rakar-Dakar, in modern day Senegal. One of the Rakari is even rumoured to have returned with an African enchantress, who then vanished mysteriously one moonlit night. Guests are encouraged to ask behind the bar for a shovel to dig for the Rakari treasure, hidden for centuries in the dunes, and a glass of special liquor that allows one to undertake an epic journey across the sea and back again in a single night. If all of this sounds farfetched, bear in mind Latvia did indeed once have ties with Africa, and very close to Dakar. Fort James in The Gambia was established in 1651, by Jacob (James), Duke of Courland. The ambitious duke also seized Tobago and had his sights on Australia. With more of the carouser about him than coloniser, Jacob’s son Friedrich flogged the Caribbean isle to the British to fund his extravagant lifestyle, ending Latvia’s fleeting flirtation with empire. Few parishes of a comparable size can be of such historical interest as Liepupe, which lies 30km into today’s final stage. The local hill-fort ruins suggest that the area may have been the centre of the ancient Liv settlement of Metsepole. In 1322, the parish of Liepupe was established under its historical name of Pernigele, perhaps derived from a local ruler called Perneyögel. Traktieris Pernigele, at Jalvagkrasti, which reopened in 2000, is an impressive inn and hotel boasting a long and colourful history. There are Swedish records of a pub here from the early 17th century, though it is likely that it existed for some time before that. 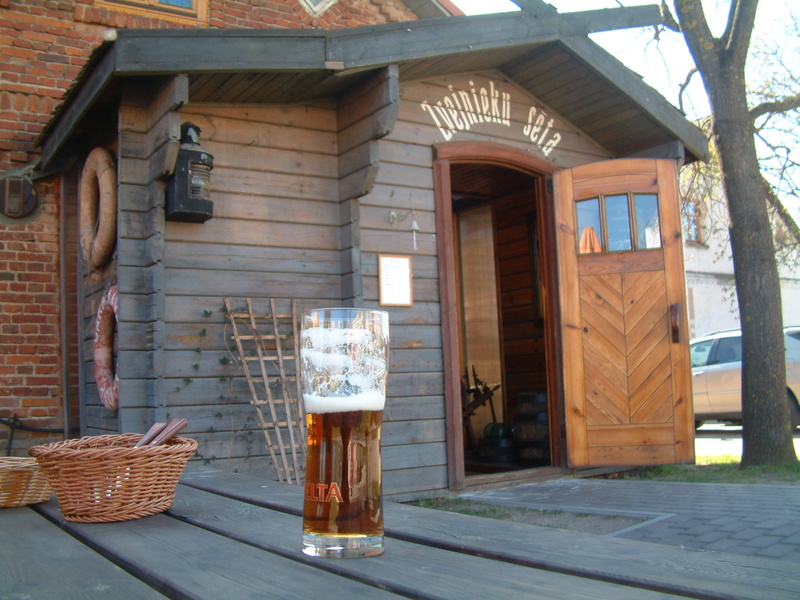 Whatever the case, it is one of Vidzeme’s most documented watering holes, not least because of some of its more notorious clientele. Baron Karl Friedrich Hieronymus Von Münchhausen was married at Pernigele’s old church, just across the way from the pub, which is referred to in historical accounts as the church pub. It is more than likely that he held a celebration of his union with fellow noble Jacobine Von Dunte at this very place, treating local peasants to a few beverages. Münchhausen’s name has become a byword for hyperbolic fantasy, lent itself to a disturbing psychiatric disorder, and inspired at least one Hollywood movie. His reputation as “the world’s greatest liar” is probably a bit harsh, as most of the Baron’s claims were harmless fibs (many of which he later denied), including his most famous: that he had ridden atop a cannonball. Among the other outrageous boasts accredited to him: that he had flown to the moon, and turned a wolf inside out. A museum to the Baron’s exploits – real and imagined – can be found down the road at Dunte, near the manor, his wife’s family estate. Nearby is the Münchhausen Wood Trail, a 5.3km path that leads through wetlands to the sea. Along the way you’ll encounter many of the weird and wild beasties that feature in Münchhausen folklore. Liepupe Evangelic Lutheran Church stands to your left on the other side of the road from the hill-fort trail. The small Baroque building is usually open, empty and quiet. With its ornate gold-leaf gilding and chandeliers, the narrow altar draws your attention, contrasting with the plain, whitewashed walls and varnished pews. The altarpiece painting is from Matthew 19:14, with a seated Christ having the little children suffered onto him. Outside, a few metres north, are the crumbling remains of the old stone church. A sign outside the church notes that Garlibs Merkelis lived in the vicarage from 1788-92, working as a private tutor for the children of local nobles. 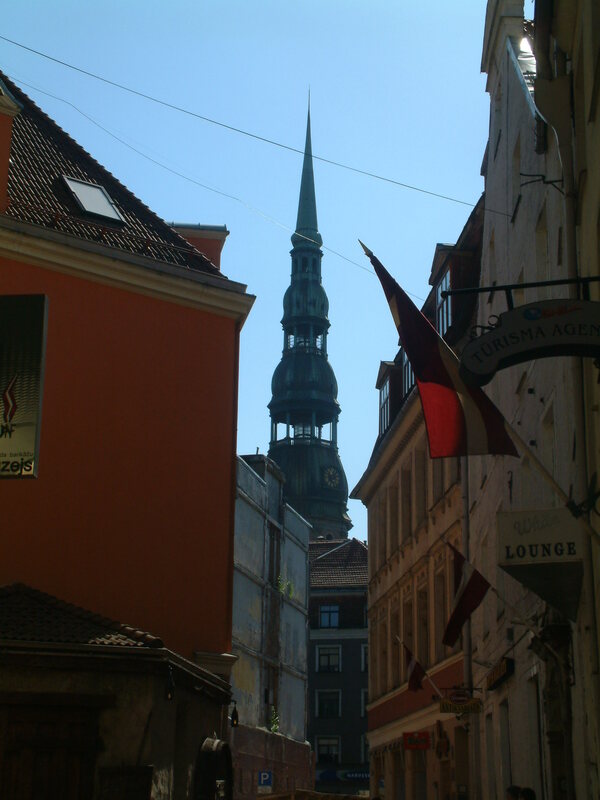 A Baltic German, who became an unabashed Lettophile, Merkelis moved in intellectual circles in Riga, coming under the influence of Enlightenment philosophy. In 1794, he published “The Latvians,” which depicted suffering of the native populace under the yoke of their cruel masters and called for an end to the injustice. Saulkrasti, roughly translates as Sunshine Coast, and while not quite in the league of its Australian counterpart, this beach town 25 kilometres north of Riga is indeed set on a pretty stretch of shoreline. It merits a final turn off for refreshment at one of the beachfront hotels. In July, Saulkrasti Jazz brings some top international musicians to town. Live performances are held in tandem with a series of workshops that afford amateur players the opportunity to pick up some tricks of the trade. If you’ve the inclination, Baltezers, on the outskirts of the Riga, makes for a good last recharge of the batteries. The area is a hive of activity on weekends when families escape from the hustle-bustle of the city to the refreshing tranquillity of the lake and surrounding forest. Ugly secrets lay hidden in these woods, which during the Second World War were the setting for some fearful atrocities. But Latvia has struggled free from the burden of these years of sorrow, and the White Lake is now a bright, vibrant location, popular with picnickers and canoeists, and particularly charming at sunset. Onwards down Brivibas and to Riga, where a deserved glass of black balsam awaits! A special mention to the Naughty Squirrel backpackers’ hostel. It may just have the silliest name in town – quite an achievement with contenders like Hotel Toss and Bar I Love You – but don’t let that put you off: you’ll not find a friendlier welcome, or better budget digs this side of the Baltic.